Caño Tiburones is an extensive coastal lagoon and wetland system on Puerto Rico’s north coast. The firm performed a hydrologic and hydraulic analysis of wetland restoration alternatives in the 4,000 ha Caño Tiburones area. 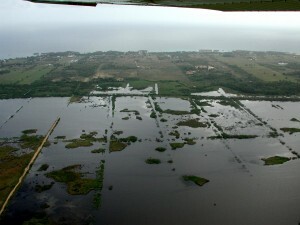 That study includes survey of hydraulic sections by precision GPS over the entire wetland area, hydrologic and hydraulic modeling of longterm water budget and regulatory flood levels, and analysis of impacts to peripheral land uses including several communities, a landfill, power plant, and other infrastructure.